People love their dogs no matter what they may do or how they may behave. The issue usually arises when other people are involved. Either you do not want to scare your friends and guests, or you do not want a lawsuit to ensue because your dog jumped on and knocked over that little old lady. So, what can you do? There is a solution. One caveat; this solution takes consistency, something that can be very difficult to generate in our modern lives. The advice to you here is, even if you fall off the horse, get back up. Even if you “forget” to train for several weeks, get back up. Dogs are amazing and they learn almost in spite of us. Here are some facts to help you win the battle of excited behavior with your dog. Establish a Routine: If you have kids, then you already know the benefits of a routine. Dogs are the same way and love routines even more. Establish a schedule for when your dog will eat, drink, exercise, excrete and socialize. For one, this makes dogs feel safe and secure. Dogs that feel this way are generally calmer overall because they are not in “survival mode” wondering how they are going to get food for the day. For another, you can set the tone of the routine. Steady, predictable actions calm dogs down. 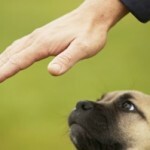 Use Body Language: From a dog’s point of view, all he/she has to go on is your behavior. If your actions are jerky, loud, erratic and unpredictable, this causes your dog to stress. Once stressed, over excitement can happen. 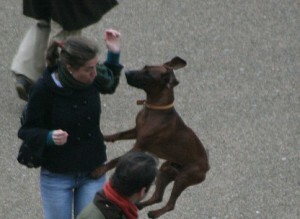 While you are simply in an irritable mood, the dog thinks danger is near and acts accordingly. Move slowly, quietly and calmly as much as possible. This communicates to your dog that all is well. Body language includes the volume and tone of your voice too. Dogs are amazing readers of subtle changes so be sure that your voice sends a message of “everything is in order” to your dog. Use a Electric Training Collar:Some hear shock collars for dogs and freak out but they are not as inhumane as you might think. 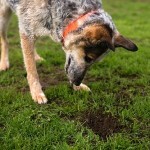 After one or two small corrections your dog learns quickly what the warning tone means and responds quickly. 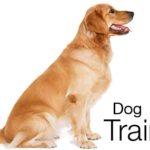 You will be amazed how quickly your pup learns and settles down as soon as he hears the tone. Don’t Be an Enabler: All of us are enablers sometimes. An enabler is someone who lets others behave as they wish. Our modern lives are busy and stressful and at the end of a tough day, it is just easier to throw our dog a treat to get them to be quiet for a few seconds. The problem is dogs are really smart. So he or she gets the message “OK, all I have to do is bounce off the walls, and I get a treat”. This is called “negative reinforcement” in the psychology world. It is negative because the focus is on STOPPING a bad behavior (because the dog is driving you crazy) and it is reinforcement because the dog gets food for doing the behavior. There is a canine mantra that goes “Never give a dog anything for free”. That is, always make your dog do what YOU WANT them to do, before you give a treat. It won’t take long for them to do the correct behavior. Dogs are fairly simple creatures; they want food and to belong to their pack. Use these desires to your advantage. You have your work cut out for you. Bringing small bit of kibble with you around the house and everywhere you go is going to be your life for a few months. Place bags of treats anywhere you may need them, so that you can access them. This is especially true if you are taking your dog out in public. Offer a treat for the correct behavior, and your dog will gladly sit calmly and wait.